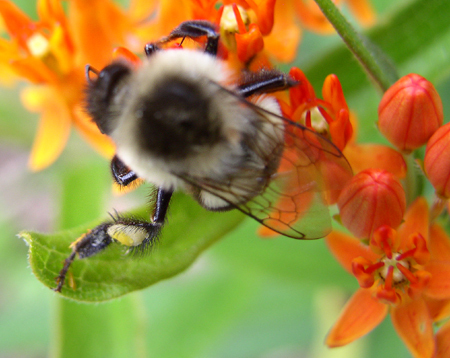 Bumble bees collect nectar and pollen to feed the babies and that is how they pollinate many flowers. Some are generalists that visit many different kinds of flowers while others are more specialized. The species with longer tongues show a preference for flowers with deeper throats although they can also reach the nectar of flatter flowers. Those with shorter tongues are more limited in their choices. 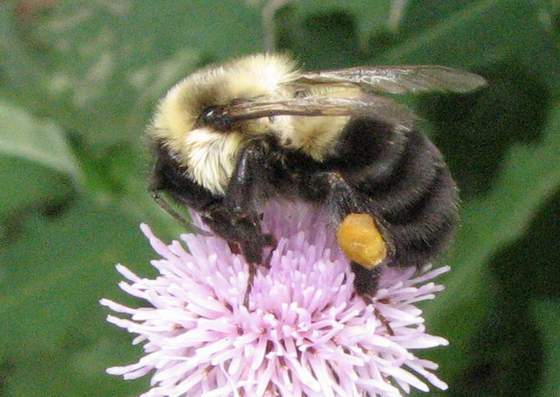 Body size also matters; larger bumble bees may keep the smaller ones from visiting favorite flowers. 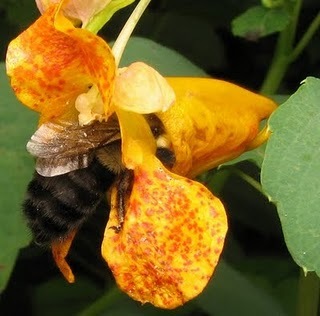 Because of their wide geographic distribution and long season (from spring to fall), they are pollinators of a wide array of wild flowers, as well as some important crops such as tomatoes, eggplants, alfalfa and clover. 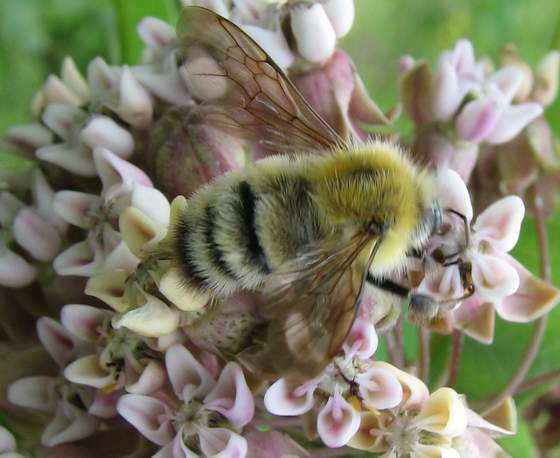 One interesting feature of bumble bee pollination is that they can practice the so called buzz pollination, a deed that honey bees never mastered. Some flowers don’t have ready available pollen; instead they keep it inside the anthers. 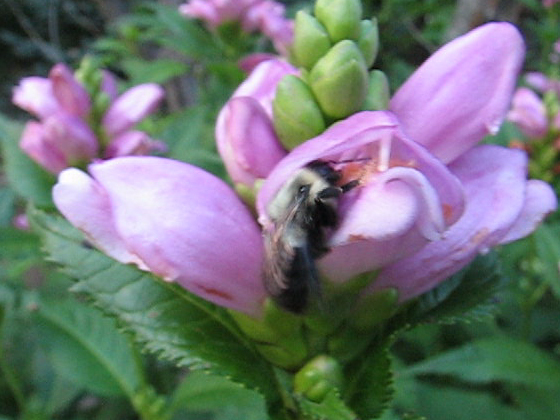 Only a pore at the tip of the anther allows the pollen to escape. For that it is necessary to shake the anther, just like a saltshaker. 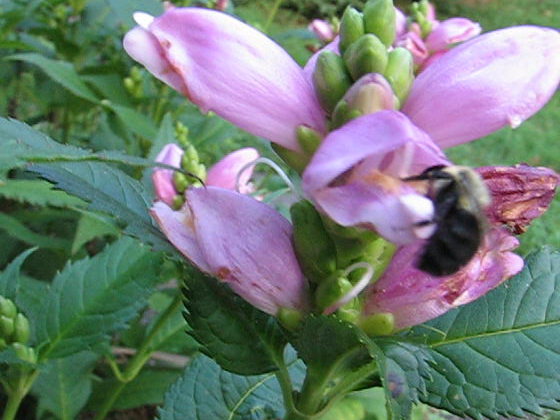 Bumble bees and a number of native bees are pros at this shaking. They use their flight muscles to cause a vibration, easily heard if you are near. Plants in the tomato family, such as tomatoes, peppers, eggplants, and members of the Ericaceae family, such as azaleas and rhododendrons, blueberries, cranberries and a few other berries, require this form of pollination.